What really caused The Great Inflation? “Eleven years ago, we rescued Britain from the parlous state to which socialism had brought it.” – Margaret Thatcher, 1990. Now, I do not wish to make light of the issues of the 1970s. There were indeed serious industrial and economic problems during that era in the United Kingdom, by which successive Governments were brought to their knees in their struggles to solve. Nonetheless, life in that decade was not exactly the perpetual living purgatory of which we are often told. Having been born in 1975, my own memories of the decade are scant, but I have enough knowledge to say that what is often described as ‘misery’ was more just ‘inconvenience’. Inconvenience, what is more, that was both intermittent and far less widespread than the media, at the time and subsequently, liked to claim. More importantly, there is a tendency to blame these problems on the wrong causes. The problems that came to a head in the 1970s had in fact been simmering for decades beforehand. British industry in particular had been struggling since the Second World War. Thanks to the Blitz, a significant amount of the country’s industrial base had been damaged or destroyed, while the strain of trying to supply the war effort had left the surviving remnant rather worn out by the return of peace in 1945. It was also somewhat obsolete, and smaller in capacity by far than the two industrial ‘super-powers’ of the new era, the United States of America and the Union of Socialist Soviet Republics. With this decline, the British were no longer able to maintain control of their Empire, meaning that the act of procuring imported resources from abroad now had the added inconvenience of actually having to pay for all of them. Therefore, the British Government had to start paying attention to bothersome details like balance-of-trade i.e. making sure that the value of imports did not consistently outweigh the value of exports. The Conservative Governments of the 1950s, led by economic third-raters such as Winston Churchill and Anthony Eden, frequently failed in this endeavour. The ‘Bretton Woods‘ system of international finance, designed and implemented in the 1940s, introduced fixed exchange rates, where the values of all other currencies in the agreement were ‘pegged’ to the value of the US dollar, which was in turn pegged to the price of gold – 35 dollars to the ounce. This made sense, as the US held most of the gold in the world at that time. The value of a currency would be kept roughly the same by buying and selling reserves of it. For instance, if the British pound became too weak, the Bank of England would start buying reserves of sterling on global markets, in exchange for other currencies it held in its reserves, reducing the supply of pounds overseas while upping demand for them. This exerted an upwards pressure on the pound’s international value. By the same measure, any time the pound was starting to get too strong and was in danger of increasing its value above the agreed exchange rate, the Bank of England would print more money and put it into overseas markets in exchange for foreign reserves, increasing the international supply of sterling to match demand, and exerting a downward pressure on its value. Bretton Woods also introduced the International Monetary Fund and the World Bank. These played a priceless role. They would lend reserves of foreign monies to countries whose own native currencies were depreciating, and which did not have sufficient overseas reserves of their own with which to buy back their own money from global markets. Once enough of a country’s native currency had been bought back to ease the pressure, the country then had to concentrate on repaying the IMF. This system was very, very effective at stabilising international finance, and preventing the economic chaos of the 1930s that had led to the Second World War. Bretton Woods carried on barely-challenged for over twenty years. Even so, during these two decades, the UK had twice run into severe difficulties, due to the exchange rate of sterling being pegged too high. At the outset the exchange rate the pound had been pegged to was $4.03 – clearly much too high to maintain given the war-exhaustion of British industry at that point. Clement Attlee’s Labour Government had correctly accepted a loan from the USA to fund a comprehensive rebuilding program, but carelessly accepted a condition that the pound should become freely-exchangeable with the US dollar on open markets, starting from 1947-8. With US industry booming and British industry still struggling to find its feet again, once the condition of free exchange kicked in, holders of sterling inevitably started dumping the pound and buying up dollars in a mad rush. The pound immediately started sliding in value, violating within hours the pegged exchange rate the Government had committed to. In a desperate bid to stop the run-on-the-pound, Attlee was forced to impose a massive 30% devaluation of sterling, dropping its ‘pegged’ rate to just $2.80. With the pound now exchanging for considerably less in dollars than it had previously, holders of sterling no longer had as much to gain by selling, and the slide in the pound’s value came to a halt. This new exchange rate was maintained through to the late-1960s, but it was under another Labour Government, that of Harold Wilson, that economic and industrial problems finally became so pressing that another devaluation was unavoidable. After the Conservative Government of Harold MacMillan had made the questionable decision to make the pound fully convertible in 1958, its value had become a lot more vulnerable to international pressures. With unimpressive British economic performance in the early 1960s, investors started selling the pound, again weakening its value. The UK borrowed foreign reserves from the IMF with which to buy back sterling from overseas markets, re-stabilising its value. But foreign reserves were soon exhausted, and the British Government needed to pay the IMF back. To add to difficulties, the Tory Chancellor of the Exchequer, Reginald Maudling, unveiled a large package of fresh public spending. This package was officially called Run For Growth, but was effectively an attempt at ‘buying’ extra votes at the 1964 General Election, with the aim of keeping a tiring Conservative administration in power a bit longer. Maudling’s gambit failed, and Wilson won with a majority of just four seats to form the first Labour Government in thirteen years. The effect this spending did have was to up aggregate demand at a time when industry was too sluggish to meet it, causing inflation to rise. Therefore, Wilson, who had an ambitious program of technology-based reforms planned for the economy, inherited a very uncomfortable economic situation that was to keep hampering his attempts to implement his plans. The country still had to find sufficient foreign capital to repay the IMF, while inflation was rising. In order to stabilise the pound’s value and increase foreign reserves, Wilson wanted to increase exports while deterring demand for imported goods on the domestic market. Fewer imports would mean fewer foreign reserves being spent, and higher exports might create a surplus that could be used to buy up stocks of foreign currency and use it to pay back the IMF. An increase in exports would also help to ‘anchor’ the value of the pound, as purchases of British exports would require pounds to begin with, meaning demand for sterling was rising. It would have been most effective to devalue the pound again in 1965. That would again have deterred investors from selling pounds if they were to get less in return for them, while also making imported goods more expensive on the domestic market; importers would have to spend a higher number of pounds to import the same amount of goods from abroad, and increasing prices they charged for them to compensate, making them less attractive to British consumers. At the same time, British export goods would become more competitive overseas; a cheaper pound would mean importers in other countries could buy up British goods more cheaply. Britain’s balance-of-trade would immediately have improved. Wilson was reluctant to devalue though, partly on grounds of sterling being a reserve currency held in large amounts by developing countries that might be hurt by the sudden decline in worth of their holdings. Even more though, he was unwilling to make the move while he had such a slim majority in Parliament. In the 1960s, a silly, romantic notion of the pound’s value being a ‘patriotic virtue’ was still dominant around the country, especially among people with little economic knowledge – which was the great majority. So Wilson held fire. Fortunately for Labour, the Tories were in considerable disarray. With their popularity hitting rock-bottom in 1966, Wilson called another General Election, and this time won by a near-landslide. Having secured an emphatic majority of 97 in the House of Commons, Wilson was now in an ideal position to devalue, and still have plenty of years ahead to recover from any political damage it caused, but again he was unwilling to risk it. It was only when 1967 proved to be a particularly bad year for British trade that Wilson finally relented. The Six-Day War between Israel and its neighbours had badly disrupted the oil market in the Middle East, causing fuel prices to rise. The UK therefore had to spend more on importing oil, causing its import costs to go up. Growth worldwide was affected by the same pressures, reducing global spending power, and British exports were going down accordingly. Unemployment started rising due to sluggish domestic demand, while a dock-workers’ strike hampered British exports further. The pound was back under heavy pressure, and Wilson at last accepted the inevitable on the 19th of November. He devalued the pound from $2.80 to $2.40, a sizeable 14% reduction, and delivered a televised speech to the country in which he attempted to reassure the British populace that “the pound here in Britain, in your pocket or purse or in your bank, has [not] been devalued”. This was not intended as a lie, as there would indeed be no direct effect on the value of the pound on domestic markets, at least not for some months. And what effect it did have on prices would largely be confined to imported goods. But there was an enormous furore in the media and in Parliament against Wilson, who was derided as incompetent for failing to maintain the pound’s value, and deceitful for claiming that the pound had not lost any domestic value. In the modern era, we are well used to contrived Tory outrage of course, but this was another example of it from an earlier time. In spite of remaining the dominant figure in British politics for most of the next nine years, Wilson’s reputation, fairly or otherwise, never entirely recovered from the devaluation ‘crisis’. Although the performance of the economy did improve somewhat over the next three years, and the balance-of-trade figures generally moved back into the positive for most of that time, it did not prove enough for Labour. The party’s performance in the opinion polls had improved in 1969-70, enough for Wilson to risk calling another Election one year early. But the balance-of-trade figures were published a few days before the country went to the polls, and they were in deficit for the first time in months. That did for Labour’s hopes. Labour lost over seventy seats, while the Tories gained sixty-nine, and won with a modest but workable majority of thirty-one. Edward ‘Ted’ Heath, who had become Tory leader in 1965, had for the most part had a miserable time as Leader of the Opposition. He and Wilson famously despised each other, and up until devaluation, Wilson had largely swatted Heath around at the despatch box of the House of Commons with merry ease. Harold Wilson and Edward Heath, two notoriously bitter rivals who dominated British politics from 1964 to 1976. After 1967, in which Heath had made as much political capital as he could out of Wilson’s devaluation predicament, the Tory leader’s fortunes had improved somewhat, and he had even enjoyed a couple of years ahead in the polls. Even so, it came as a shock when Heath won the 1970 Election, especially given that Wilson had risked calling it a year early. 1970 was a tremendous vindication for Heath, after years of being undermined by many in his own party. He was the first ever leader of the Tories who had emerged from a working class background – even if his ‘BBC accent’ might have given the reverse impression – and that meant he was unlikely ever to be given much patience by the aristocratic and plutocratic ‘blue-bloods’ who still dominated the Conservative Party. Now, if he so wished, Heath could have thumbed his nose at his pompous critics, as he stood on the front steps of the most powerful office in the land. To his credit, he did no such thing. However, given what was to happen over the next four years, it might have been better for his posterity if he had never made it to 10 Downing Street. Heath was a Prime Minister for whom it is possible to feel genuine sympathy, as he did suffer a lot of very bad luck during his time in office. But at the same time, he also made some terribly naive mistakes, for which he really had no one to blame but himself. Heath got his first stroke of bad luck as Prime Minister just over one month after winning the Election. Iain MacLeod, his newly-appointed Chancellor, and rated by many as the ablest man in the Conservative Parliamentary Party of the time – certainly one of the most experienced – suddenly died of a heart attack. Personally, it was a sad loss for Heath, for whom MacLeod was a respected old friend. Politically, it was a disaster for him. Not only was MacLeod a very sharp and capable minister and debater, he was also one of Heath’s closest and most-trusted advisors. Moreover, he was probably the most capable economic mind in the entire Cabinet. Had he not died, it is just possible that at least some of the chaos of the 1970s would have been avoided. Heath had run his Election campaign on a platform of widescale withdrawal of Government from running or intervening in British industry. He had come to the conclusion, rightly or wrongly, that the policy encouraged by John Maynard-Keynes of investing state money into industry during recessions to re-stimulate the economy had started to cause stagnation. Failing businesses would often be bailed out by Government grants so they could carry on trading, and not have to lay off staff, and so slow down rises in unemployment. The down side, as Heath saw it, was that failing businesses, knowing that they could probably get a bail-out, no longer had the same incentives to reform or improve their practices or strive for greater efficiency. Heath therefore agreed to give industries far more freedom of action, while at the same time, making it clear to them that he would not come running when misfiring firms got into trouble. This strategy was broadly in line with the new ‘Monetarist‘ thinking of Milton Friedman (even though Heath had never really been terribly taken with Friedman’s ideas). Heath anticipated a whirlwind of initiative and activity from business leaders, freed from the ‘shackles’ of state interference. Sadly for Heath’s hypothesis, his first two years in office did not produce much good economic news at all. Again, bad luck played a role. In the USA, President Richard Nixon, struggling to control growing inflation problems caused by the demands of the unending Vietnam War, suddenly abandoned the Bretton Woods System. He had initially tried to devalue the dollar against the value of gold to stop its slide, but this simply caused holders of ‘greenbacks’ to exchange money for gold, causing the dollar’s value to slide even further. Therefore Nixon decided to unpeg the dollar from the price of gold entirely, effectively ending the whole post-war system – although the UK did not officially ‘unpeg’ the pound’s exchange rate for several more years. Exchange rates around the world suddenly had no central ‘anchor’, and began fluctuating wildly, exercising an inflationary pressure on many currencies, including sterling. British businesses continued to struggle, and those that were in the worst trouble, without hope of rescue by the state, now went to the wall. Those that survived often did so by laying off staff and reducing wage bills. Unemployment was therefore continuing to rise, and by 1972, it went past one million. Heath and his new Chancellor, Anthony Barber, near the end of the previous year, had unknowingly dropped an absolute clanger in their attempts to infuse more life into industry, in the shape of the Competition & Credit Control Proposals (C&CC). These were a variety of distinctly Tory reform policies for the British banking industry. They altered a number of small details, but the overall ‘big’ purpose of the changes was to remove all state-imposed caps on lending by the Banking sector. This included allowing banks to sell mortgages, which had previously been the sole preserve of Building Societies. Heath and Barber had hoped that these C&CC measures would lead to largescale credit-investment by banks directly into industry. It would match the culture they had witnessed in France and West Germany, where banks were closely tied into the way businesses were funded. Instead, the British banking sector, well aware that there was generally less risk investing in consumers than in businesses, started shovelling out personal loans by the dustbin-load to private individuals and families, while largely ignoring business customers. With this surge in private credit, consumers, not businesses, had a massive boost in spending power, and they started using it, causing an almighty spike in demand at a time when British industry was still too weak to meet it. Inevitably, prices for goods that were scarcer than the demand for them began to climb. With industry unable to keep up with demand, exports dropped away as the domestic market absorbed most of the manufacturing sector’s output, while imports massively increased in response to the new weight of demand too. Balance of trade thus tilted heavily into deficit. Had Heath modified the lending caps – say by raising them by a margin that had to be filled with industrial investments only – instead of removing them altogether, it might well have been a wonderful move. As it was, his move was a little like using a scythe to trim one’s toenails, and metaphorically-speaking, he cut the feet off of British industry. Not fully realising the enormity of what they had done, Heath and Barber also announced a huge package of state spending programs to invest in industry, alongside tax cuts to encourage even more consumer spending. Going by the familiar-sounding name Dash For Growth, this program was a breathtaking one hundred-and-eighty-degree about-face by Heath, one that bewildered the whole country. He had gone, in the space of less than two years, from a policy platform that today we would recognise as overwhelmingly ‘Thatcherite‘, to a Keynesian social democratic platform that almost exactly matched most of the ideas that Harold Wilson had been trying with limited success to implement through the mid-to-late 1960s. It was the origin in British culture of the expression U-Turn to describe a total reversal of Government policy. After years in opposition of repeatedly carping at Wilson’s technocratic approach to economic management, Heath in Government had suddenly adopted it almost wholesale. This meant the ultimate in ‘worst-of-both-worlds’ approaches, as Heath was pursuing growth through private lending at the same time as there was a massive boost in state spending. It should come as no great surprise that inflation flew up to almost 10%. Heath might have ordered an increase in interest rates to encourage a ‘cool-down’; higher interest rates encourage people to save up and stop spending, while also making it more expensive to borrow. But when the idea was suggested to him by the National Economic Development Council, Heath refused. “I am determined to swim through the whirlpool,” he told them defiantly. It was not all bad news for Heath at this time. He got a major boost in the form of a political breakthrough at the end of 1972, when he finally secured agreement to take the country into the European Common Market, as successive Prime Ministers had been attempting since Harold MacMillan had applied in 1961. It was a big moment of triumph both professionally and personally for Heath, and whatever one’s view of the European Community/European Union, it was the undeniable high point of his entire career. It did have an unfortunate economic side-effect though. Once within the Single Market, ailing British industries now found themselves brought into direct competition with other, healthier industries on the European mainland. Inevitably, the healthier competitors won, and with British goods looking increasingly second-best, demand for them dropped. Inflation gathered pace. Then, all too soon, Heath made another foolish mistake; taking a shrug-of-the-shoulders attitude to seeing the demise of Bretton Woods, he finally decided to unhook sterling from the US dollar, and floated the pound. With the only remnant of its post-war ‘anchor’ removed, the pound was now completely at the mercy of the whims of global markets. Then more bad luck hit. Yet another war broke out between Israel and an alliance of Egypt and Syria – the Yom Kippur War. Egypt and Syria were backed by most of their oil-producing neighbours, whereas Israel was backed by most Western Governments, who provided substantial money and arms to Jerusalem. The war was fairly indecisive, albeit with Israel arguably getting slightly the better of it. The exasperated oil-producing countries therefore retaliated by economic means. They cut oil production by five percent, and declared that they would not restore production to full capacity until Israel withdrew from lands it had occupied since the Six-Day War of 1967. This cut in oil production caused what became known as the ‘OPEC Oil Shock’. Suddenly, oil was in short supply globally, significantly short of meeting demand. The price of oil had soon nearly doubled, and a few months later, it had nearly doubled again. One of the most critical power sources for British industry was now scarce and expensive, making production more expensive too, and industries had no alternative other than to increase prices still further to cover the costs. Inflation was soon nearing 20%. The UK was in its first year-plus-length recession since the 1940s, and one that would last two years. The Trade Unions had been suspicious of the Dash For Growth program, even though it had been intended – honestly enough – to include them as part of a tripartite ‘federation’ with Government and business leaders to manage domestic industry. Far from welcoming this proposed inclusion, the Unions feared it was a trick to take away their independence; an understandable worry, after Heath had pushed The Industrial Relations Act through Parliament in 1971, reducing protection for workers and placing new limitations on actions that Trade Unions could carry out. The unions therefore rebelled. As early as February 1972, miners had gone on strike, picketing the coke depot at Saltley Gate in Birmingham, and actually forced it to close for a time. The sudden surge in oil prices in 1973 therefore could not have come at a worse time for Heath. With oil now in short supply, the importance of Britain’s native coal industry was re-doubled, as coal-fired power stations were now the country’s only major source of electricity. The National Union of Miners therefore knew that they had the Government over a barrel. They announced they would go on strike again if they did not receive a large increase in wages to keep pace with price rises. The NUM Congress were angling for a 35% increase. Heath offered them a much more modest 7%. The NUM voted against the offer in a ballot, and also voted to suspend all overtime work, a move that, thanks to the huge increase in coal demand created by the Oil Shock, immediately caused a shortfall in coal stocks. Heath came back with an improved offer of 16.5%. The NUM rejected it again, and on the 24th on January, the miners voted for a full strike. Coal, and by extension electricity, were now in such short supply that Heath had to order the notorious ‘Three-Day-Working-Week‘ in order to reduce power consumption. Day-to-day life in Britain was getting very ragged, dark, cold and austere. Christmas 1973 had been a rather depressing experience for most Britons. One of Heath’s problems at this point was that he could ill-afford to allow any pay increases at all. The inflation problem was already uncontrollable, and in such an overheated market, handing more purchasing power to members of the public, even a relatively small number of them, would only accelerate the depreciation of the pound. Therefore, he had tried to introduce pay-freezes in the hope of applying some kind of brake on sterling’s slide in value. But this had had to be abandoned quickly in the face of the NUM’s near-militant resistance. The miners had already seen, with the Dash For Growth program, that Heath could be scared into performing gigantic, fundamental U-Turns, and that had encouraged them to stiffen their resistance. And sure enough, they had forced him to offer fresh pay increases. They now decided to hold out even longer, and see if they could force him to grant them the full amount they demanded. Heath was now completely stuck. With British industries operating just three days each week, manufacturing output was now so slow and intermittent, and trade was therefore becoming so badly imbalanced, that the economy was on the brink of an outright collapse. In despair at the NUM’s rejection of his offer, Heath asked one of his Private Secretaries, Robin Butler, what he should do next. Butler suggested that one possible path out of the logjam – possible but not certain – was to go to the country. If Heath could win another General Election in the midst of a crisis like this, then any democratic legitimacy in the miners’ actions would be seen to be gone, and it might just be enough to get them to reconsider the Government’s offer. The full strike got under way on the 5th of February, and just two days later, Heath announced the dissolution of Parliament and a new General Election. He painted the whole process as a choice between the Government and the Trade Unions. His slogan was Who Governs Britain? and a vote against him, as far as he was concerned, was a vote for the Unions. Unfortunately for Heath, the message the electorate gave was a good deal more mixed than that. With all the discontent that had built up over the previous few years, it was perhaps inevitable that the Tories lost quite a few seats. Enough to drop below 300 in the House of Commons. Labour’s performance, given they were up against an incumbent Government teetering on the ropes, was not madly impressive either. They gained 14 seats, just enough to take them ahead of the Tories, and up to 301. With the Liberal Party securing a total of 14 seats, and the other parties taking a combined 23, neither of the two big parties had anywhere near enough MPs to form a workable majority. With the failure of these negotiations, the game was up for Edward Heath. He needed at least two other parties, one of them having to be the Liberals, to form some kind of workable coalition. As soon as talks with Thorpe broke down, there was simply no chance of getting to the ‘winning post’ of the time of 318 seats in the Commons. On the 4th of March, Heath went to the Queen to tender his resignation as Prime Minister. The miners had successfully brought down a Government. Harold Wilson decided he was able to form a minority Labour Government, and returned to 10 Downing Street. His first act in his second tour-of-duty as Prime Minister was to end the miners’ strike. After carrying out a pay review, he gave the NUM the full 35% pay rise they had been demanding, and the industrial action came to an end. Many people around the country were uneasy at this submission, but Wilson, aware of how perilous Britain’s industrial situation had become, had had little choice; even with the Three-Day-Week, there was a real likelihood that coal stocks would run out completely by the end of March, at which point essential services like hospitals would run out of power. Wilson simply had to get the miners back to work and get the wheels of industry turning again. He also began work on repealing The Industrial Relations Act, a task completed in July that year. The resumption of something resembling ‘normal’ industrial activity soothed the anger and frustrations that had been boiling over. So after a few months of carefully treading water in a minority Government, Wilson judged that his relative success at placating the miners had won Labour enough support around the country for him to chance another General Election. With his Chancellor of the Exchequer, Denis Healey, falsely claiming that he had reduced inflation to 8.4%, when it was nearly double that, Wilson managed to gain a 2% swing from the Tories. It was not as much as he had hoped, but it was enough to establish a Labour majority in the Commons, albeit of just three seats. Wilson had won three General Elections outright, and partly won another. Heath had lost three, and his sole victory had led to one of the most chaotic Governments of the Twentieth Century. The Conservative Party finally ran out of patience with him. Within a few months, he was overthrown, to be replaced by the first woman ever to lead a major political party in the United Kingdom – Margaret Thatcher. Wilson did not have much opportunity to enjoy the downfall of his old rival. As with ten years before, he had inherited from a crumbling Conservative Government a very unenviable economic situation. Within a couple of months of the Autumn General Election, ongoing high inflation meant that the miners’ real-terms income had fallen some way behind prices again. Wilson, determined not to let the strike start up again, awarded the miners another pay rise of 35%, a decision that was met with deep disapproval at the Treasury, due to the worry that it would simply add impetus to the very problem it was intended to alleviate. In particular, it might encourage workers in other industries to demand higher pay too, which, if agreed to, was thought certain to fuel yet more inflation. Inflation was very much what Wilson needed to combat, and by this point, he and other members of his Cabinet were starting to see wage-suppression as the most viable weapon. Evidence from the decade that followed would suggest that this was not nearly as pragmatic as they imagined, but for want of a confident alternative, Wilson put together a plan for ‘voluntary wage restraint’. This was to be called ‘The Social Contract’, and would be a binding agreement between workers and the state. In return for heavily reducing the amount of industrial unrest happening around the country, the Trade Unions Congress would receive minimum guarantees of welfare state spending in support of the poor, and – more importantly – a renewed commitment to Labour’s traditional full employment program. The TUC were not happy with the low level that the minimum benefits were set at, or the restrictions on what industrial action individual workers could take when they felt they were being mistreated by employers, but accepted the terms. Throughout 1975-77, in his role as Chancellor, Denis Healey carried out a startlingly ruthless program of expenditure cuts. In the space of less than three years, he removed over £7 billion from the public budget – well over £49 billion in today’s money – in his quest to reduce demand and to slow down inflation. At a time when unemployment was up to 1.4 million, the program was met with astonishment and outrage from the left wing of the Labour Party, including Cabinet ministers like the Industry Secretary, Tony Benn, and even some on the Labour Right, such as the new Foreign Secretary, Tony Crosland, expressed growing unhappiness with the program as time passed. In among all this, Harold Wilson, clearly suffering severe exhaustion and possibly the early onset of the Alzheimer’s Disease that would destroy his mental faculties throughout his declining years, stepped down as Prime Minister in 1976. He was succeeded after a tersely-fought leadership election by James Callaghan. Callaghan had had the distinction of serving in all three of the most powerful departments in British Government since 1964. He was Chancellor of the Exchequer from 1964 to 1967, then Home Secretary from 1967 to 1970. From 1974 to 1976, he had been Foreign Secretary. In this light, it seems entirely natural that he would be the next Prime Minister. He had a long and close friendship with the Trade Union movement, and so many on the party’s left were optimistic about his appointment. However, at the Party Conference in 1976, Callaghan and Healey delivered speeches that effectively started the ‘Labour Civil War’ that was to blight the party’s existence for more than a decade to follow. Trade Unions were furious when Healey declared that he was going to persist with and add to the spending cuts of the previous year. He was in the middle of negotiating a new loan with the IMF, which he hoped to use to purchase sterling from overseas markets and to bolster the currency’s value. As part of the terms of the loan, the IMF insisted the UK cut spending much further and much deeper than had so far happened, and Healey had acquiesced. 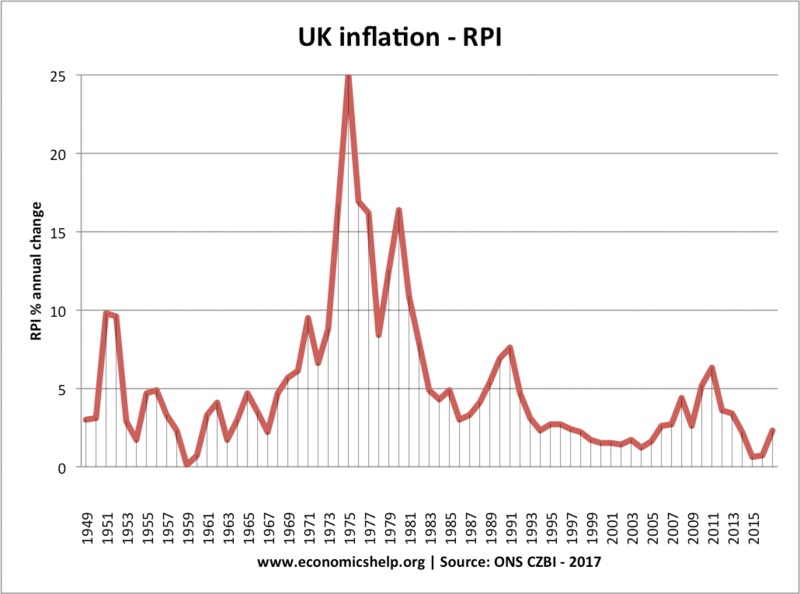 In other words, the rises in inflation during the era of post-war British industrial decline did not correlate in any recognisable way with bursts of state investment in the economy to correct recessionary activity. There can be no doubt that Callaghan was aware of all that. He was simply lying. In truth, by this time, the use for a fresh loan from the IMF was negligible anyway. North Sea Oil had been discovered in the late-1960s, and by the mid-1970s, it was finally starting to arrive ashore in substantial amounts. If Callaghan’s Government had handled it cleverly and with more courage, they could have used this resource to mitigate all manner of difficulties. For one thing, it gave them a native alternative to coal, lessening the danger posed by any more Miners’ Strikes. For another, it reduced the amount of oil the UK needed to import from the Middle East, lessening the danger of inflationary impacts from any future oil shocks. But perhaps most of all, the Callaghan Government could possibly have used the oil to ‘anchor’ the value of the pound far more effectively, without having to introduce anywhere near such brutal spending cuts. Had they had the nerve to defy the ‘Petro-dollar System‘ introduced by Nixon a couple of years earlier – the international trading rule that all oil transactions around the world had to be paid in US dollars (which, as every country in the world needed constant supplies of oil, drummed up enormous demand for dollars, protecting their value) – then they could immediately have raised substantial demand for sterling by insisting that British oil had to be purchased in UK pounds. It would certainly not have been anything like as effective as the Petro-dollar of course, but it would still have had a substantial effect. Moreover, the revenues from selling the oil, argued Tony Benn – who by now was the Energy Secretary – could have been used to create what is now called a ‘Sovereign Wealth Fund’, to pay for a proper program of industrial renewal. The idea was rejected in Cabinet; the majority of Ministers wanted to use the revenues simply as a substitute for taxation, just like the Thatcher Government would throughout the 1980s. Labour in effect just handed the decision on how to make use of the oil over to the Tories at the end of the 1970s, choosing not to risk rocking the boat with the USA. They missed so much potential in the ideas of the oil fund, and in using demand for oil to help anchor the value of the pound. The Trade Unions simmered with resentment, feeling that they had been double-crossed. Their view, rightly or wrongly, was that Callaghan’s Government was breaching its commitments under its own Social Contract. Having delivered their side of the deal, and reined in industrial action to a dramatic degree, TUC leaders were expecting a new Prime Minister with close ties to the Unions now to increase investment once more and work on creating more jobs, as the Social Contract promised. Instead, Callaghan and Healey were telling them that there would be even more cuts, and the ongoing rise in unemployment was going to be left unchecked – perhaps following the Monetarist idea that full employment is itself a cause of inflation. Although Healey’s cutting program, it must be conceded, did see inflation decline to below 10% once more by early 1978, how much that was down to the cuts themselves, and not to the growing international interest in British oil, is open to debate. Worse, it was causing unemployment to rise, in direct contravention of the terms of the Social Contract. As for the IMF loan, half of it went completely unused, so unnecessary was it, and it was all paid back very quietly and comfortably, without incident, and on time. It had been a huge, painful effort to obtain funds for which the country had had little use, and the strain of gaining which had been borne solely by the poorest. The Labour Government of Jim Callaghan, in short, was not behaving like a leftist administration at all. It was in fact being significantly more conservative in its program than Ted Heath’s Government had in its final two years. Even though inflation had fallen, it was still very high from a modern perspective. Statutory incomes policy had capped wage increases for public sector workers at no higher than 5% per annum, and with inflation still near the 10% mark, it meant that rises for the poorest workers were still much too low to keep pace with prices. Resentment finally hit boiling point in the autumn and winter of 1978 – ironically, the coldest winter to hit the country in many years. Renewed industrial action started in September. The car manufacturer, Ford of Britain, had had a very good year, and could afford to give its workers a substantial pay increase. But as some of its work was done as a Government contractor, it chose to impose the 5% cap. The Ford workforce were furious, and came out on strike. The Transport & General Workers Union formally joined the strike early in October, increasing the number of participants to almost sixty thousand. Ford backed down and offered a new rise of 17%, and Callaghan responded by announcing that there would be a sanction for both Ford and over two hundred other firms that had broken the 5% cap. It was a mistake. Left wing Trade Unions now demanded that the Government stop intervening in wage negotiations, while the Confederation of British Industry threatened to take the Government to court over the sanctions, on the grounds that they may have been illegal. A vote in Parliament overturned the sanctions on the 13th of December, thus establishing legal precedent that the Government did not have the authority to impose penalties on firms that chose to ignore Government pay-restraint policies. This, of course, was the green flag for other Trade Unions who felt that they had been hoodwinked. Realising there were no legal repercussions that the Government could now inflict on any company that co-operated with wage demands, and knowing how many of their members were struggling with the growing cost of living, Trade Unions went into full-on revolt once more. A strike by lorry drivers soon began, one that once more threatened fuel supplies. The Government wanted to bring the army in to carry out the task of shipping oil while the lorry drivers were unavailable, but in order to do so, they needed to declare a formal State-of-Emergency, and to commandeer the facilities of oil firms. The overtones of such a decision would be almost totalitarian, and Callaghan resisted the idea. Eventually, the oil companies settled on a 15% pay rise. With the 5% cap having no legal power behind it, there was nothing Callaghan could do to stop it. Worse, this rise only affected drivers shipping oil. Other transport workers had received nothing, and in mid-January, the transport Unions declared more official strikes. Most essential goods were shipped around the country by road-haulage, so serious shortages began to set in, and during a period of painfully cold weather, the wider public were starting to suffer again as they had during the Three-Day Week. Perhaps most notorious of all – although also most overblown of all – was a gravediggers’ strike that started in Liverpool and Manchester. It remains, to this day, very useful material for anti-leftist scaremongering by right wing politicians and media. Some eighty cemetery workers on Merseyside and in Tameside went on strike for roughly a fortnight, causing distressing but ultimately quite minor delays to burials of the dead. Liverpool city council hired a warehouse to serve as a temporary ‘back-up’ mortuary, and at one stage the total number of corpses stored up reached over one hundred and fifty. This was all very unpleasant, especially for grieving relatives, but in truth, the strike was very isolated and brief – the gravediggers accepted a rise of 14% in short enough order. However, the right wing media were looking for any dirty trick they could find to force Labour out of Government. Derek Jameson, then the editor of the Daily Express, cheerfully admitted as much in the late-1990s. The Express and other rags therefore tried to find ways of giving the impression that the dead were going unburied, and rubbish was piled up on every street, in every tower and hamlet across the UK, with no end to the chaos in sight. In truth, the problems were intermittent and usually localised. For all that life had turned unpleasant again, most of the problems were more matters of inconvenience than of outright deprivation. The industrial unrest cooled as the spring arrived, but the damage was done. The beleaguered Labour Government had been almost helpless to stem the tide of unrest, which, thanks to shameless media exaggeration, seemed a lot worse to people than it probably really was. The public were now as furious with Callaghan as they had been with Heath five years earlier. Thatcher tabled another Motion Of No Confidence in the Callaghan Government on 28th of March. This time, without the Liberals on-side to prop them up, the Government lost the Motion by a single vote, and Callaghan was forced to call a General Election for early May. No one was surprised at all when the Conservatives won to form a new Government, with a modest but solid majority of 43. For better or worse, the infamous age of Thatcherism had begun. On losing, Callaghan is quoted as saying that a ‘Sea Change’ had happened in British politics, and that the social democratic consensus since the war was no longer accepted by the country. Therefore, he felt that he had to accept it and go with it; whether he liked it or not, the free market was where the country wanted to go now, due to exhaustion with Trade Union disruption. He also complained to his dying day that his old friends in the Unions had betrayed him. This was, on both counts, pretty hypocritical, for Callaghan was bemoaning developments of his own creation. He had carried the country away from the social democratic consensus himself, and in so doing, he had broken the word of the Social Contract his party had signed up to, and therefore he was the one who had betrayed the Unions, not the other way around. Thatcher’s arrival was historic. She was the first woman to be Prime Minister of the United Kingdom, and she effectively spent ten years formalising a new consensus of what Wilson, Callaghan and Healey had set in motion. A consensus of free market power and monetarist economics. The chaos would not end there though. Far from it, the 1980s would continue to be a period of serious industrial and social unrest, and the economic problems of high inflation and recession would never go away for the entirety of Thatcher’s reign; deep recessions occurred at either end of her premiership, and inflation, brought down in the early-to-mid-1980s only by artificial recessionary policies, would fly out of control again late in the decade. For much of the 1980s, unemployment, which had already seemed startlingly high at just over 1.5 million under Callaghan, surged up to above 3 million. Thatcherism, really just an expansion of Callaghan’s economic program, did not solve anything, and many of the problems we are now enduring – created by the financial sector’s abuse of the power Thatcher handed it – have their origins in the choppy waters of the ‘Sea Change’ Callaghan described. The real aggravation for myself when listening to the general discourse about the disarray of the 1970s is that the majority opinion appears to be, “Socialism caused everything to go wrong.” Does that even come close to describing the realities of what happened? Surely not. Firstly, the UK, even in the 1960s and 1970s, has never been a ‘socialist’ country by any realistic description at all. Social democratic, yes, but not socialist. It did not have industries run by workers’ collectives, for instance, while even co-operatives were very much the exception rather than the rule. Secondly, the problems stemmed from obsolescence, not from redistribution. An exhausted, out-of-date industrial base, having received insufficient new investment over a period of thirty years, had not been renewed to anywhere near the standard needed to compete in the age of superpowers. Thirdly, the moment when economic troubles finally flew out of control was under a Conservative Government – Edward Heath’s – not a Labour one; it was the removal of lending caps for banks that started the Great Inflation. Ted Heath, as mentioned above, had removed the caps on lending, moving the financial sector into the free market. Heath had floated the pound. Harold Wilson created a ‘Social Contract’ that in effect reduced state support for the poor, while demanding more from workers for less. Both Wilson and Jim Callaghan promised the Trade Unions that if they curtailed their industrial action, spending cuts would be temporary, but then went back on their word, thus defying the rights of workers. Both Wilson and Callaghan chose to stop the state from making use of North Sea Oil to support the value of sterling, or to fund the renewal of British industries, aiming to use the proceeds of selling oil to fund tax cuts – just like Thatcher after them. Denis Healey, very taken with the free market Monetarist ideas of Milton Friedman and other right-wing economists, imposed such a comprehensive range of spending cuts that his Austerity regime, when adjusted for inflation, was as deep and as ruthless as that of George Osborne. It led to widespread disgruntlement and unrest, culminating in the ‘Winter Of Discontent’. None of these is left wing, or even particularly centrist, politics. They were all firmly Torified moves, strongly resembling many Conservative policies of subsequent decades. It was free market conservatism that triggered the problems of the Three-Day-Week, and then the ‘Winter Of Discontent’. The absurdity of the 1980s was that Margaret Thatcher was unshakably convinced that the cure for the illness was even more free market conservatism. Far from reversing Callaghan’s program, as the modern myth assumes, she actually picked it up and ran with it at double the speed, and as mentioned above, that led to even more unrest through the 1980s, with riots in Toxteth and Brixton, and a particularly bitter resumption of the Miners’ Strikes. So when you hear semi-informed Tory voters warning, “Don’t vote Labour! See what a mess they made of things in the 70s!” point out to them that the mess was passed down to them by Conservatives. But more important, also point out to them that when chaos set in as a result of Labour’s mistakes, the biggest mistake of all that they were making was to govern like the Conservatives. As for the mechanical warning that we must avoid a return to the 1970s like the plague, I can only retort with contempt. The warning is usually voiced to deter voting for Jeremy Corbyn, but it is an empty warning. Not just because the social and industrial structures of the time are not what the Labour left are aiming for today, but because, quite honestly, the 1970s were no worse than what is happening right now. Truly. There were only a little over two-and-a-half years in total time during that decade when life was genuinely all that unpleasant – 1972-74 and a few months in 1978-79. Whereas in the modern era, nine years of totally needless and poisonous Austerity have literally killed thousands of people, caused outrageous mass-poverty, and largely prevented a full, balanced recovery from the Global Financial Crisis of 2007-9. The 1970s were a time of confusion, but the modern era is a time, quite literally, of death. Confusion alone is better than state-sanctioned murder, so after all this, a return to the 1970s, for all the confusion it might cause, would be a sizeable step up. Just look at the last ten years in Britain, and ask yourself, honestly, could a Real Left Labour Government simply trying to implement a Scandinavian-style social democracy really make things any worse?